Can you believe that Tesla has only really manufactured two cars, the original Roadster and the Model S? That's it. You'd think they have been pumping out multiple models for years, such is the buzz around the company,aided by owner Elon Musk's undoubted ability to steal column inches. The tweaks and upgrades made to the Model S since its 2012 debut have created a car that's truly excellent, and already Tesla has managed to convince around 80,000 reasonably well-off people across the globe to ditch their gas-guzzling motors and opt for all-electric transportation. Want a petrol car? The best SUVs are here. The best supercars are on this link, since you ask. I popped over to Tilburg in the Netherlands to nose around Tesla's newest factory, which is set to pump out 450 cars per week to meet European demand, have a chat with Elon Musk and, most importantly, sit on the bonnet of a Model S P90D. Oh, and drive it, too. I was not disappointed. This is where the crazy starts, but before that, let's break down what P90D means. The 'P' stands for 'Performance', the 90 refers to the 90kWh output of the lithium-ion battery packs and the 'D' indicates that this model uses an electric motor to power each axle. In other words, it's all-wheel-drive. Right, now that's out of the way, let's focus on the performance stuff. The latest model features a new smart fuse that allows the electric motors to draw more power from the batteries, resulting in frankly terrifying acceleration. The official figures claim that when Ludicrous Mode is selected from the main dash menu - yes, it's actually called Ludicrous Mode, as the above image proves - the P90D can rocket from 0-60mph in 2.8 seconds. That's 0.4 seconds quicker than a bloody Lamborghini Huracan. To experience that sort of acceleration for real is a different matter. The electric motors deliver the power with such efficiency that there's not a hint of wheel-spin or torque steer. The car basically goes from standstill to warp speed in the time it takes to blink. It's a mind-blowing, face-wobbling, trouser-threatening experience. However, if you're looking for a thoroughbred sports car, you might be slightly disappointed. The batteries mean this bloater tips the scales at over two tonnes, so its party piece really is drag racing super cars. It settles down into more of a comfortable cruiser once you've finished behaving like a maniac. Be warned: the theoretical 330-mile range won't be so achievable after you've given it the beans off the lights for the 100th time. On the other hand, it'll still outlast a Nissan Leaf and keep a smile firmly on your face. The new-fangled fuse doesn't just improve acceleration from the traffic lights, it also means the P90D keeps pulling to its 155mph limit. The result is much smoother overtaking, even at autobahn speeds. It's now possible to drop the hammer at 70mph and feel a sudden surge of torque take you to the 100mph mark. Please don't do that in the UK, though. The handling and general dynamism could be improved upon further, because this isn't really a car you'd want to fling around your local track day. Elon Musk has previously been pressed on whether he's going to make an all-out sports version of the Model S. His take is that he doesn't really see the point, and to be honest, I don't see the point either. It's not often you want to dabble in a big smoky drift when you've got passengers in the car, and the Model S is all about passenger comfort. There's little else out there that can destroy an open piece of road like this Tesla, especially when said road is lined with traffic lights and begging to be given the old Ludicrous Mode treatment. The more observant among you will have noticed that some of the images we've used are actually of the P85D. That's because Tesla still hasn't taken official photos of the P90D - that's how hot off the presses this is - but it's also because absolutely nothing has changed, looks-wise. 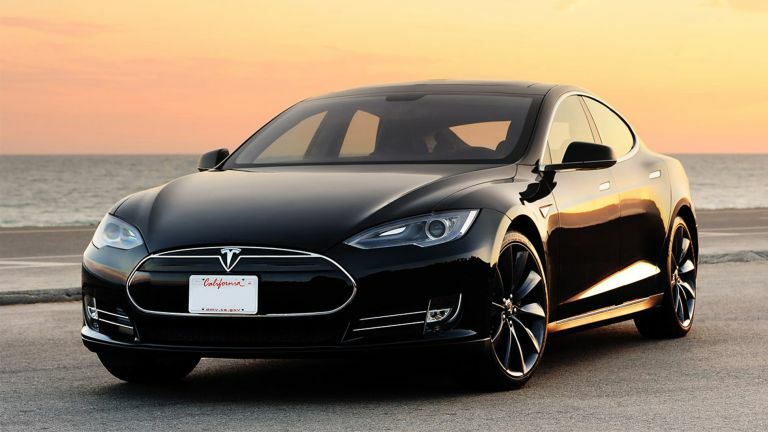 The Model S remains the same svelte saloon that is always has been. Customers can select from a number of alloy wheel designs, add little carbon boot lid spoilers and select from an array of subdued exterior hues to jazz up their motors but the only thing distinguishing this model visually from the rest of the gang is the little chrome badge on the back that says P90D. There's nothing hugely new to shout about in the interior either. The inside of a Model S remains a very cool, very special place to sit. There's not much thought given to the rear passengers, who don't even get cup holders, but the latest generation of seat options are far more comfortable than previous attempts. The same enormous 17-inch touchscreen display remains in the centre of the dash, which operates absolutely everything from the glorious panoramic sunroof to the volume of the stereo. It can be a little bit distracting, as having an enormous Google Maps to mess about with on the move often proves too much of a temptation. But there's good news here, as an imminent software update will add a load of cool features to the Autopilot suite of autonomous driving functions, so you don't have to do as much of the boring driving stuff. The Model S will soon be able to autonomously switch lanes with the flick of an indicator stalk and keep within its lane without steering input from the driver. Better still, it will slot itself into all manner of parking spots - yes, even the dreaded parallel - at a prod of the touchscreen. Thus freeing up more time to muck about with Google Maps. Now, before you rush out, credit card in hand, read this: there are a number of niggles to overcome if you wish to enter the world of battery-powered vehicles. The first is the issue of charging, and if you're thinking of plugging the Tesla into a standard wall socket, forget it. A full charge can take upwards of 40 hours. Instead, it's a good idea to have a wall box fitted at home, which means you can achieve a full charge overnight. Better still, Tesla's gradually increasing Supercharger network is free to use and can offer around 170-miles of range in under 30 minutes. There are around 22 locations and 68 chargers in the UK at the moment, meaning you can travel most of the main arterial routes without worry. The P90D's performance is nothing short of sensational. Now granted, to be able to accelerate from 0-60mph in 2.8 seconds while shrouded in a luxurious and comfortable cockpit would be even better, and the P90D's interior is nowhere near as special as that found in the BMW i8, or even the i3 for that matter. The surfaces are sparse and you have to tick an options box if you want real leather. The P90D with the performance upgrade costs £85,700 and for that, you could enjoy the truly sumptuous surroundings of a Mercedes S-Class. Even so, early adopters will find it's spacious and comfortable, with enough room for three people to squeeze into the back seats thanks to the absence of a transmission tunnel. Above all else, however, the synapse sizzling straight-line performance of the P90D is enough to have any anxiety surrounding range or price eradicated from the brain instantly.